The Swagger All-Terrain Bipod is a revolution in mobile, adaptable support. Nothing is more critical to gun-hunting success than a steady hold. It doesn’t matter how tightly your gun groups at the range. If you can’t keep the crosshairs steady on the shoulder of a giant buck, you’re going to miss – or worse, make a wounding shot. If only range-like accuracy could be achieved in the hunting woods. That was the thinking that brought the folks at Swagger Bipods to create their All-Terrain Bipods. Hunters have sought better in-the-field accuracy for decades. Traditional bipods, portable rests, blind bags – such products help, but they all fall short in critical areas. Swagger Bipods provide a steady hold, even in the most stressful situations, and in any terrain or stand setup. If you’ve tried a non-attached bipod, you probably don’t use it today. In addition to being another item to carry and forget, such bipods often cause more issues than they solve. Whether it’s trying to get the bipod set up after you see a big buck, or whether it’s the inability to adjust the bipod when that buck is on the move, traditional bipods and shooting sticks cause delays and rushed shots. The Swagger All-Terrain Bipod Field Model is a revolution in mobile, adaptable support. Like traditional gun-mounted bipods, the Swagger Field Model has extendable legs to easily adapt to any terrain, including uneven ground. Unlike traditionally mounted bipods, the Swagger Field Model has ample adjustment for standing (or any position) shots, plus the ability to adjust as your target moves – and it does so automatically! Thanks to Swagger’s exclusive Flex Ready legs, which provide solid support while also allowing the All-Terrain Bipod legs to move gently as a hunter shifts point of aim, you just follow the buck with your scope. Your Swagger will smoothly adjust as you follow the target, keeping your crosshairs rock-steady. Traditional bipods allow some adjustment up and down, but they fail miserably when an animal moves. Instead of panicking and scrambling to readjust the bipod, a Swagger shooter simply keeps the animal in the crosshairs until the right moment to pull the trigger. Shooting sticks? Forget about adjusting on the fly, and good luck keeping them in place when you have to pick them up and move while still holding onto your gun. The Swagger Field Model is ideal for Western hunters, spot-and-stalk situations or anywhere shots from the ground are likely. It easily adjusts from 6¾ to 29 inches and adapts to any shooting position, including prone, kneeling or standing. To fully appreciate the innovation and benefits of Swagger Bipods, visit www.ShootWithConfidenceTV.com. 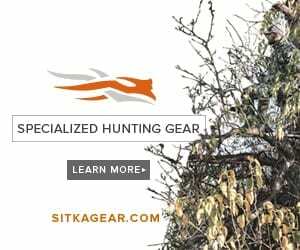 There, you’ll find instructions on how to use a Swagger, along with some great shooting and hunting tips – and even a few hunts with the Swagger in action! To order a Swagger Field Model or Treestand/Blind bipod, visit www.swaggerbipods.com.